Hexagon doesn’t really have a subdivide function that quadruples the number of faces of an object (like ZBrush for example). But there is a trick we can use to add this functionality. 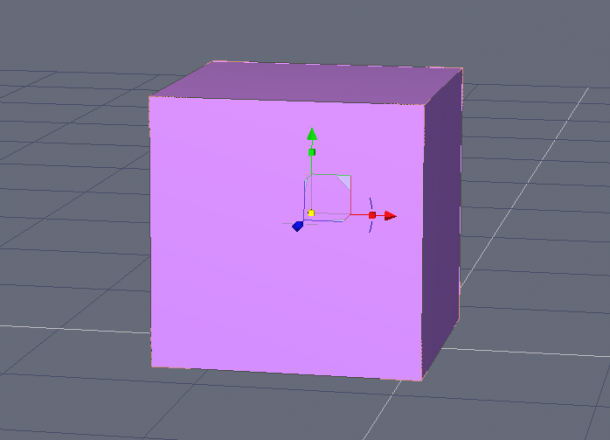 Take Hexagon’s cube primitive here. All we can do is to specify one without subdivisions. If we need more, we’re stuck. There is another cube primitive on the Second Life tab, but it has too many faces, so we won’t worry about it and stick with this guy above for the moment. To subdivide all faces equally, head over to Face Selection mode (F2), then select all faces of your object. CMD+A (or CTRL+A) will do the trick. 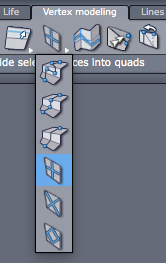 With all faces selected, choose the Quad Tessellation tool on the Vertex Modelling tab. As soon as you select it, all faces will be divided into quads (when possible). Feel free to choose any of the other subdivision algorithms if you wish. This works with objects other than cubes too of course. The more polygons you’re trying to subdivide at once, the higher a chance you have to crash Hexagon. Therefore it’s a good idea to save your document before attempting to carry out this trick. And remember: each full subdivision will quadruple the amount of faces on your object. Give Hexagon a moment to calculate this (you won’t receive any feedback while it’s working). Excellent tip. 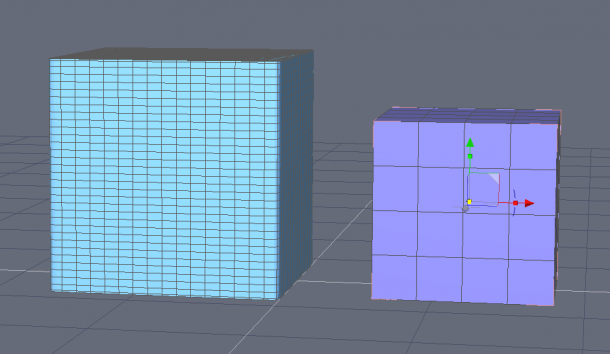 I tried using the smoothing icon, but as the icon says… it smooths the object. Not something that you want to do on a hard edged object such as a cube.